We are starting the final week of BM 29. I know I say this every time, yet can’t stop myself from saying it. Days simply fly and I feel sad that yet another BM comes to an end, carrying with it the month that went by. Can’t believe this year has already over by six months and it feels like just yesterday we welcomed the new year. Anyway coming back to the theme, I have chosen to do Course wise meal from any state, with specific sub category. I always feel making the theme little more complicated within the assumptions of sensibility, we do end up reading more on the cuisine than anything else. I somehow ended up selecting Maharashtrian dishes and finally on Lunch dishes. It has to be rice and gravy types again. Of course it refers to anything that goes as a combo. Today’s post is the last in reverse order. 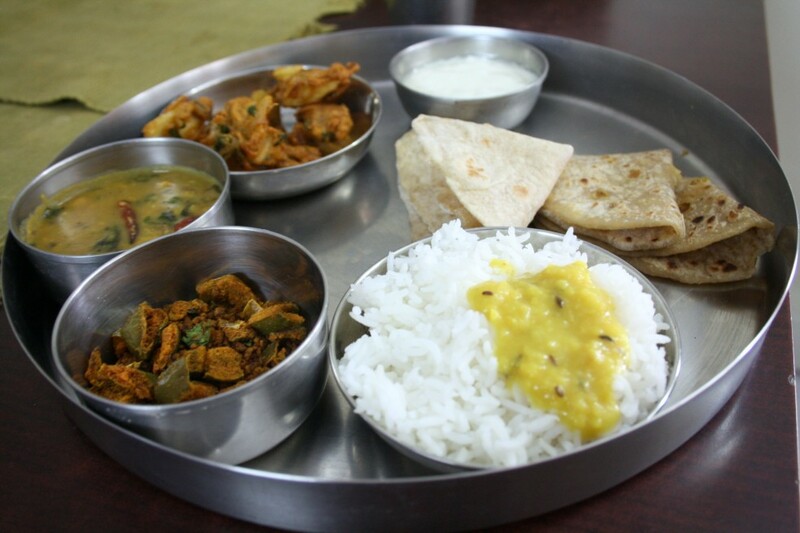 I made this simple thali this weekend, unlike the rest of it that were done couple of weeks back. This month was very relaxing as I managed to cook most of the dishes as part of our everyday dishes and that surely helped. It goes against my belief that I need to cook BM posts the day before and really stress myself. For a change, having all the dishes clicked, proved quite good for the whole schema of things. 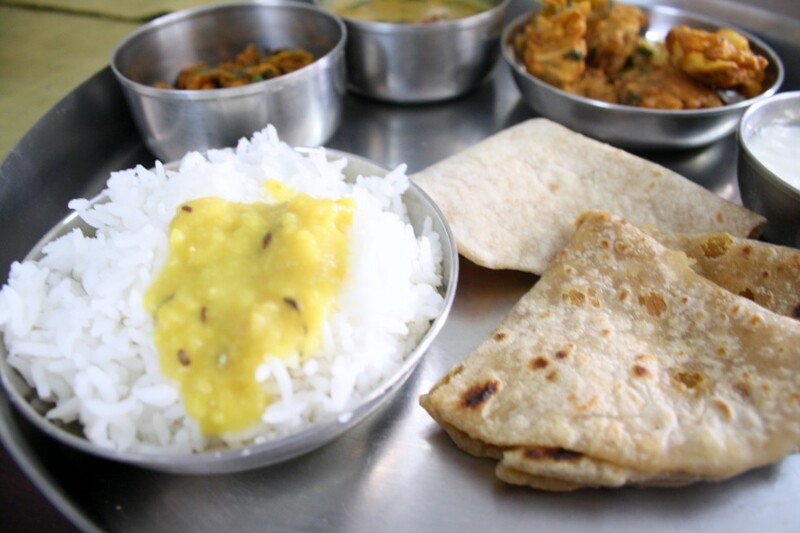 The recipes I prepared were shared by a Maharashtrian in a group that I am member of. I must say that I can’t claim on the authenticity of the way I have prepared, though she typically shared how it is prepared at her place. So any flaws in the method is all mine and not intentionally done. As with all, recipe is just a reference, we end up cooking it as how it might suit our family, though I tried my best not to change much. On the whole we loved it and I was happy that Konda loved this meal. It’s rare she eats dal and rice willingly. Though the thali I made is in no way a part of the traditional thali that makes up a Maharastrian thali, I decide this makes a mini thali on its own! Wash dal. Wash spinach leaves in salt water. Chop them. In a pressure cooker, take the greens along with dal and add enough water and turmeric. Pressure cook or Boil them till soft. Mash dal and spinach. Keep aside. Chop onion. Crush garlic cloves. Wash peanuts. 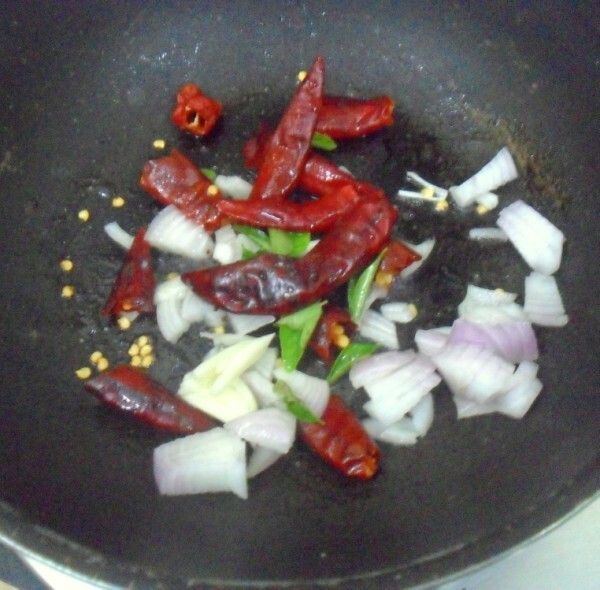 Heat a kadai with oil, when hot add mustard seeds. When mustard seeds crackle, add asafoetida, red chilies, curry leaves and garlic cloves. Add peanuts and fry. 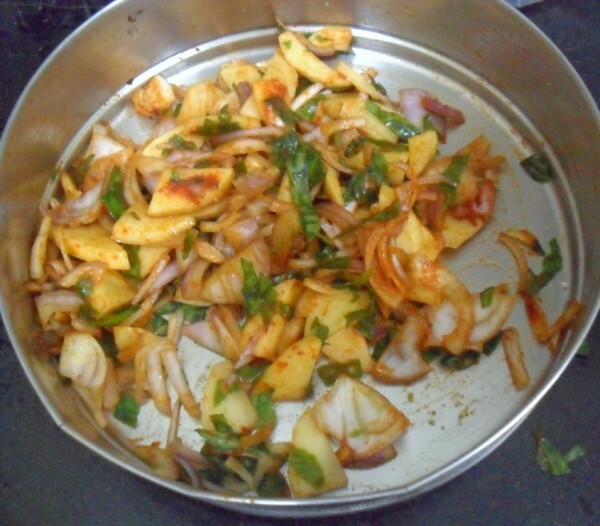 Add chopped onions and fry them till translucent. Pour dal and spinach mixture into the pan. Add water for desired thickness. Bring it to a boil. Add salt, Lime juice and simmer for 10 minutes. 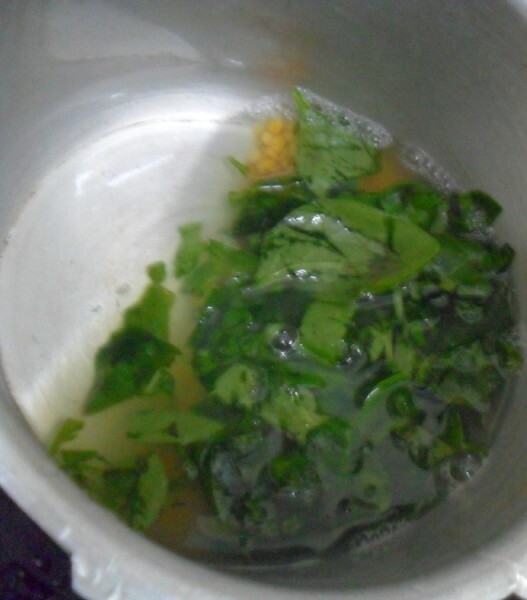 Garnish with coriander leaves while serving. 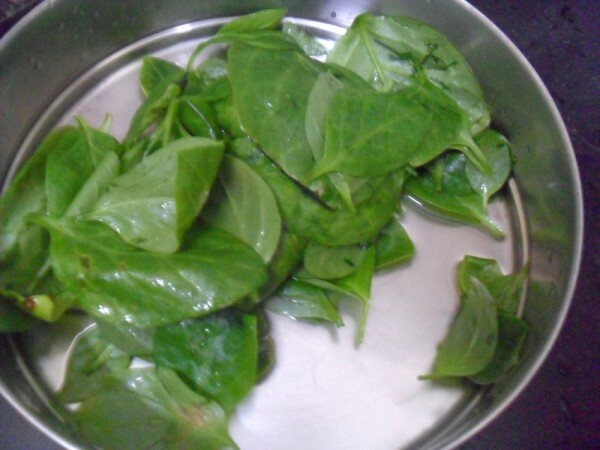 Methi leaves can also be used along with Spinach. 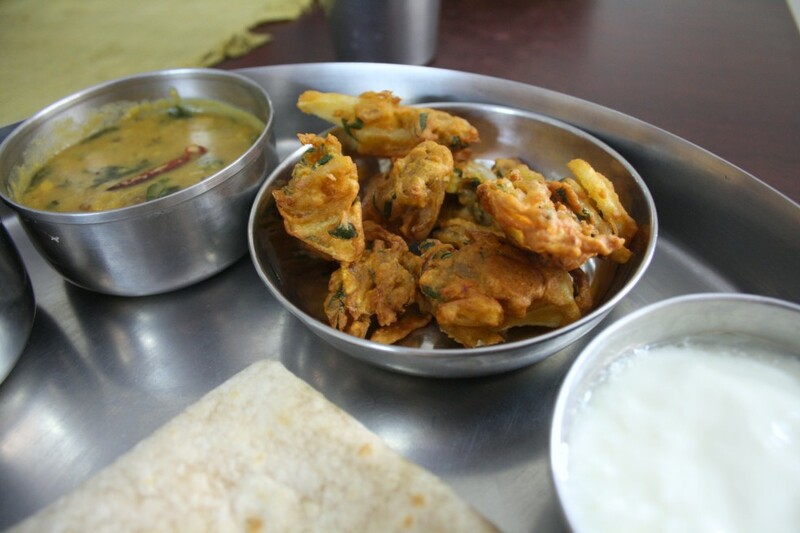 This pakora recipe is derived from the kadhi Gole recipe that I had. Since I wasn’t planning to make the kadhi, I was tempted to just make the pakodas. As I had the spinach leaves, I mixed up the rest and made a delicious pakoras. The pakoras really added zing to the entire thali. Imagine if Konda loved the dal because of these, you can know delicious this must have been. 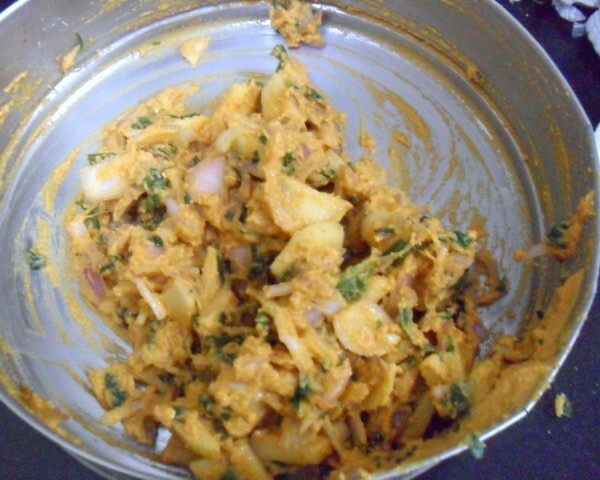 You must have made palak pakoras, or aloo pakoras or most onion pakoras, however all mixed up together gave an altogether different taste. The original recipe calls either for spinach or potato, I mixed up both. Take all the ingredients in a bowl, and mix well. Slowly add water to make a thick batter. 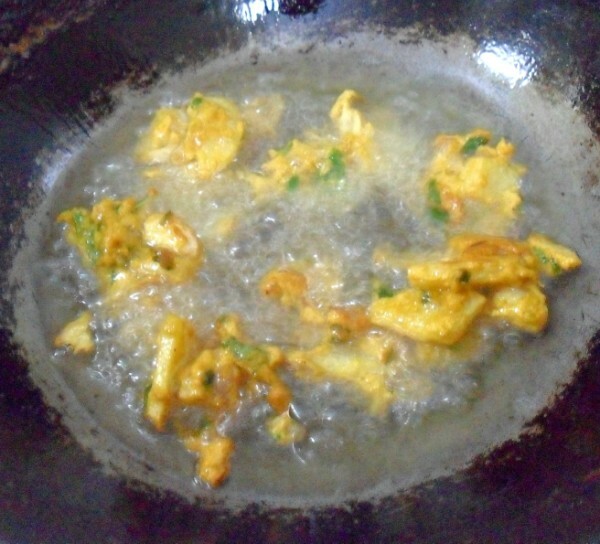 Heat a kadai with oil enough to deep fry and gently drop in the batter and cook on both sides. Drain on a kitchen towel. This is exactly the same as Mudda Pappu. Except maybe the consistency of the dal. Varan Bhat is supposed to be the mandatory start in a Maharashtrian Meal, just as in Andhra. So I didn’t’ want to miss out on this. 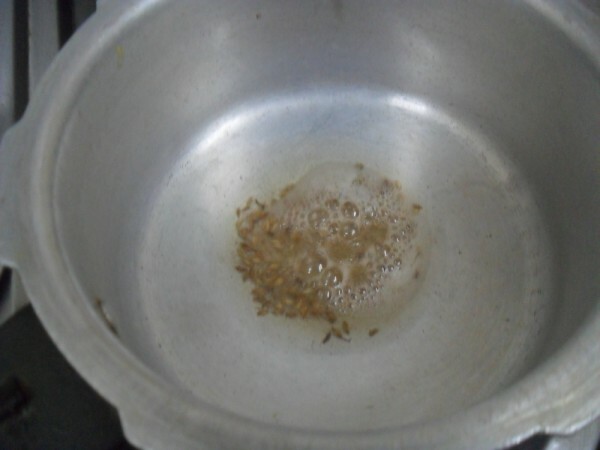 Take 1/2 cup toor dal, wash well and pressure cook with a pinch of turmeric powder and few drops of oil. Once the pressure falls down, heat a kadai with a tsp of ghee, temper with 1/2 tsp cumin seeds, add the mashed dal. Add salt and 1/2 cup water and bring to boil. Serve with steaming Rice. After thinking so much about the recipes that are famous in Maharashtra, I can’t miss out Puran Poli. I know Puran Poli is what we make as Sweet Poli. However one major difference that I knew differs from the natives I spoke with, said they make with wheat flour. Whereas I can never imagine Poli being made with anything other than maida. However since I found almost all the blogs showing wheat flour, plus two source while talking, confirmed that they do actually make with wheat flour, I went ahead and made it. I must confess it wasn’t the same. It tasted like sweet chapati. And yes it didn’t taste like our regular poli. Still I was glad that I made this as well. 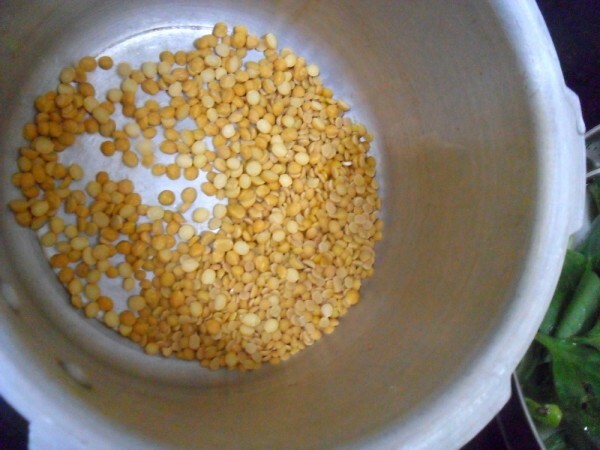 Filling made with Channa dal and jaggary of 1 cup each. Made the usual way as I normally make poli. 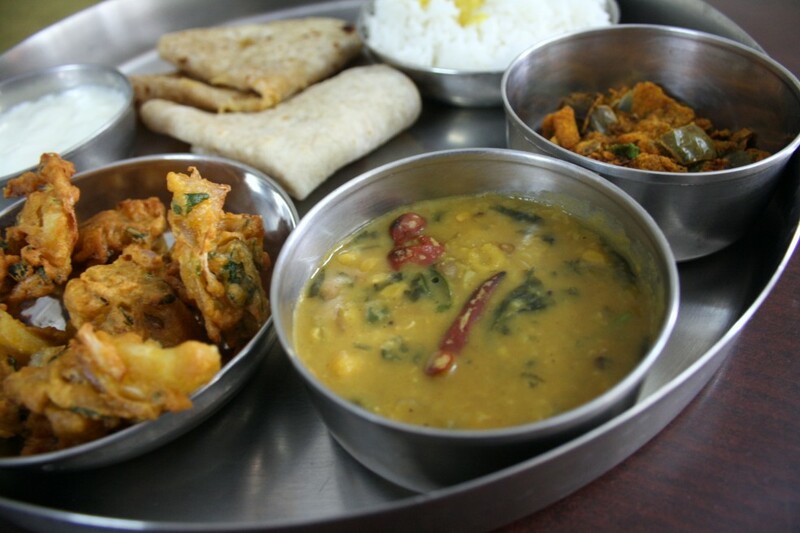 The mini thali with all the dishes looks tempting.I had been eyeing those pakoras ever since I saw them on weekend cooking.and yes even in Gujarat the poli is made with wheat flour. 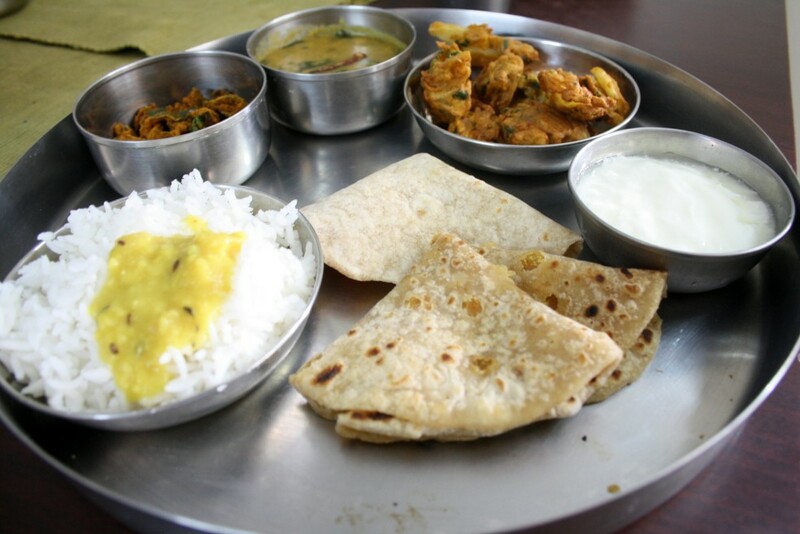 You are making me hungry with such wonderful thali!! Such a complete wholesome meal. Looks great. The pakoras look and sound scrumptious. Tempting thali there!! Loving those pakoda!! !Yes I do agree we change the recipe a bit to suit our tastes! !! looks real yummy ! wonderful clicks ! That is a very tempting thali Valli. wondeful and lipsmacking thali!Sis i want to join Blogging Marathon.I totally missed two months.This time am late too.Sorry sis,please include me. Omg, wonderful platter, dunno how u have this much time to make a complete thali..beautiful dishes, everything looks fabulous. Love this go green concept!! Will try this version too. Need to finish the plate. 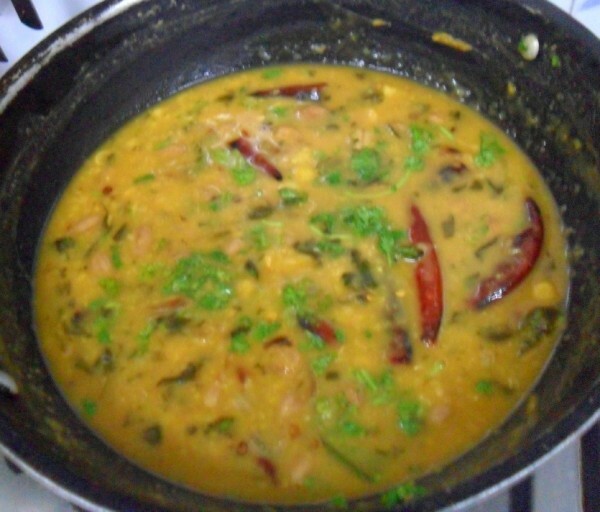 In spinach dal you have mentioned about curry patta but didn't tell where to use that and I didn't know what it is? Can you explain ? Manju I added it as we normally do during tempering at the end. That thali looks soooo good Valli. Simple everyday dishes–so comforting and yummy!! 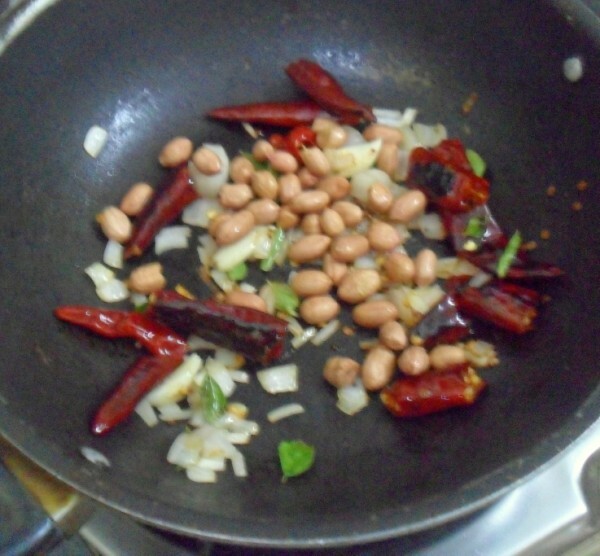 I loved cooking Maharashtrian dishes too. They are so earthy and delicious. Thali looks soo good Valli – wonder where u get the time with 4 blogs, three kids, a day job and playing princi maam to all of us at BM :-)) hats off to ur patience !